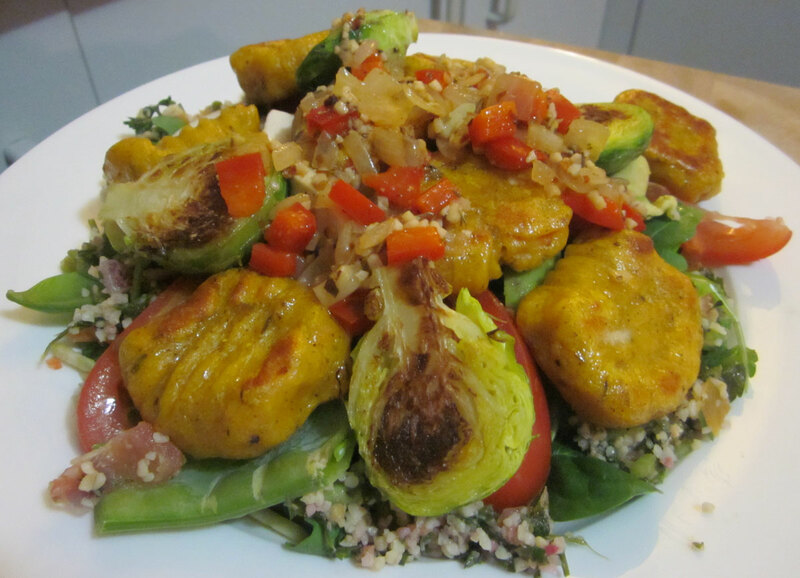 Pumpkin Gnocchi Part 2 – it’s a salad! Well I decided to try something a bit different, and make a salad with pan-fried gnocchi. First of all get your salad ready, you can use whatever you like. On a plate I put a bed of baby spinach and rocket, tomato, mushroom, avocado and julienned carrot, beetroot and celery, ready to get topped with the gnocchi, brussels sprouts and sauce. Next heat a frypan with some olive oil and fry the gnocchi and sprouts over a medium heat until they’re nicely browned. When they’re done, remove them from the pan and put the somewhere to keep warm while you make the sauce. I used the oven on a very low temp. Add a little more oil to the frypan if you need to, then add the onion and garlic and cook for a few minutes before adding the capsicum. When they’re cooked, turn the heat down to very low and add the margarine, thyme, pepper and chilli. When the margarine has melted, add the lemon juice and stir it well. Arrange the gnocchi and sprouts on top of the salad then pour the sauce over the top. Yep, it was good!